Shortly before 1300 hours, Box 501 dispatched units from Steelton, Bressler, Harrisburg, and Paxtang to assist Station 73 (Arcelor Mittal) with an explosion and fire at the Arcelor Mittal steel plant facility. Engine 73 arrived on location with a 2 story, brick and cinder-block, building with heavy fire and smoke showing. 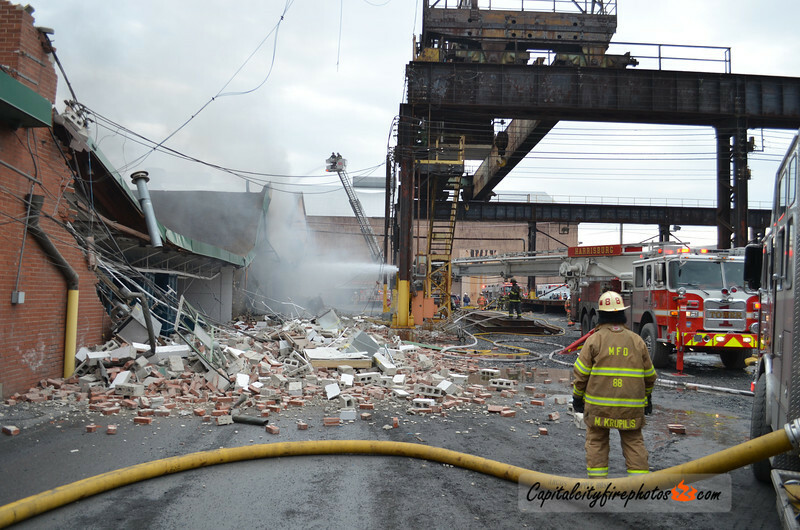 Additional companies from Swatara Township and Middletown were requested to the scene. Several master streams were deployed to knock down the bulk of the fire which created a large column of smoke that drifted over the borough. The fire building is located in the area of the 100 block of N. Front Street is used as a washroom for plant workers. No injuries were reported in the explosion and subsequent fire which is believed to have been caused by a natural gas leak.